All jokes aside, the kit seems like a water fountain in the middle of the desert. Prior to this, I only owned the Hoola Bronzer, because honestly I find it completely unreasonable to charge someone $29 (or in my case 34,50€) for a cardboard box. The cuteness is not enough to salvage a mental asylum situation. Even the excellent quality of Benefit’s blushes wasn’t enough to justify the price to me. The kit comes with five of their best selling shades. Dandelion, Hoola, Rockateur, Dallas and Coralista. Dandelion (7 g/0,25 oz) is claimed to be a “brightening finishing powder”, but since I highly doubt anyone would put pink shimmery powder as a powder on their face, I’m gonna say it’s a pale pink blush. 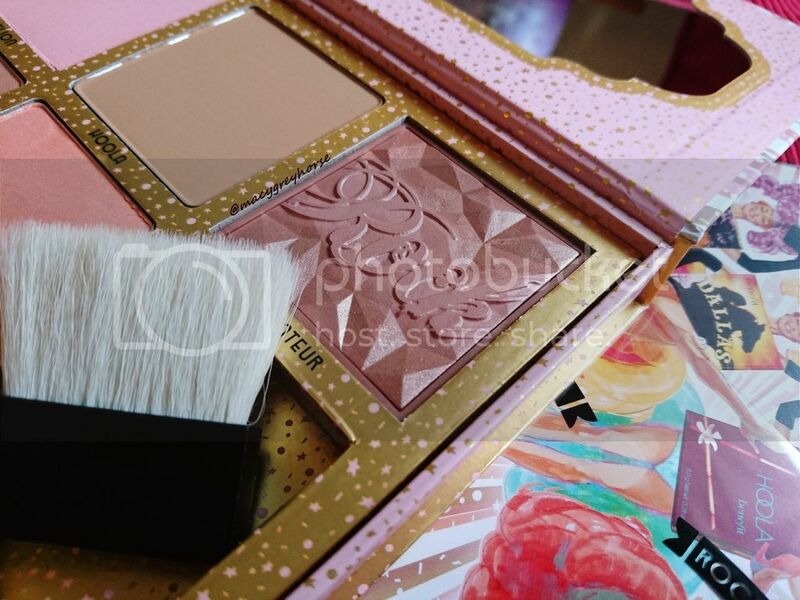 Hoola (8 g/0,28 oz) is maybe their most famous powder. It’s a matte, cool toned bronzer, that can easily be used for contouring the face and surprisingly works for both light and medium skintones. Rockateur (5 g/0,17 oz) is the rockstar of the bunch. A baked mauvy-pink blush with a finely milled golden shimmer, is certainly the showstopper as far as quality and finish goes. Thank God it’s in here, because the actual packaging of the Rockateur is so kitsch… it’s disturbing. On the other hand, you get the least with it, as far as quantity is concerned. Dallas (9 g/0,32 oz)is a mauvy brown blush with a teeny tiny hint of shimmer. I really like this shade. 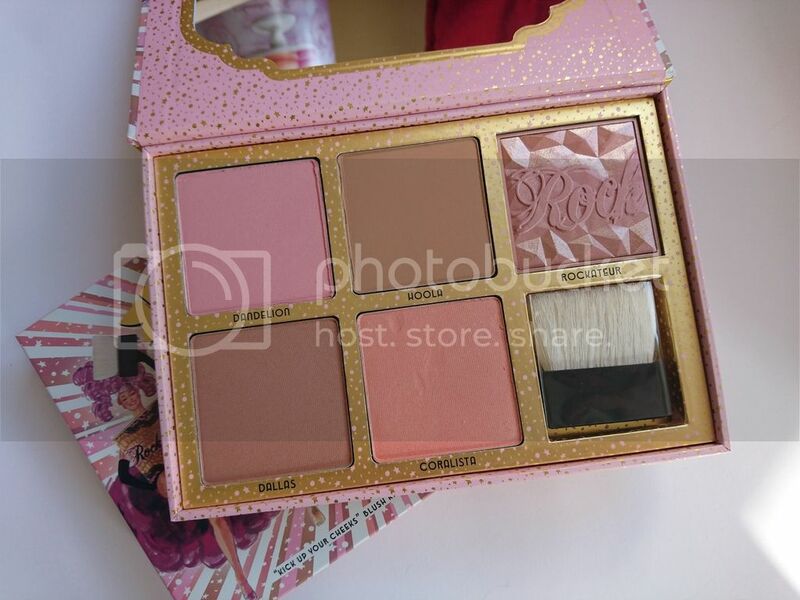 Last but not least, Coralista (8 g/0,28 oz) is the safest bet when it comes to blush. Who doesn’t love a good ol’ peachy shimmery blush? The powders in the kit are full size. Meaning you get the normal amount you would get in the boxed form. The differences in amount are due to the different finishes of the powders. You also get a natural bristle brush, that bears a distant resemblance to the NARS Ita brush and a good sized mirror. Handy dandy, for sure. Another notable thing is the way the powders smell. 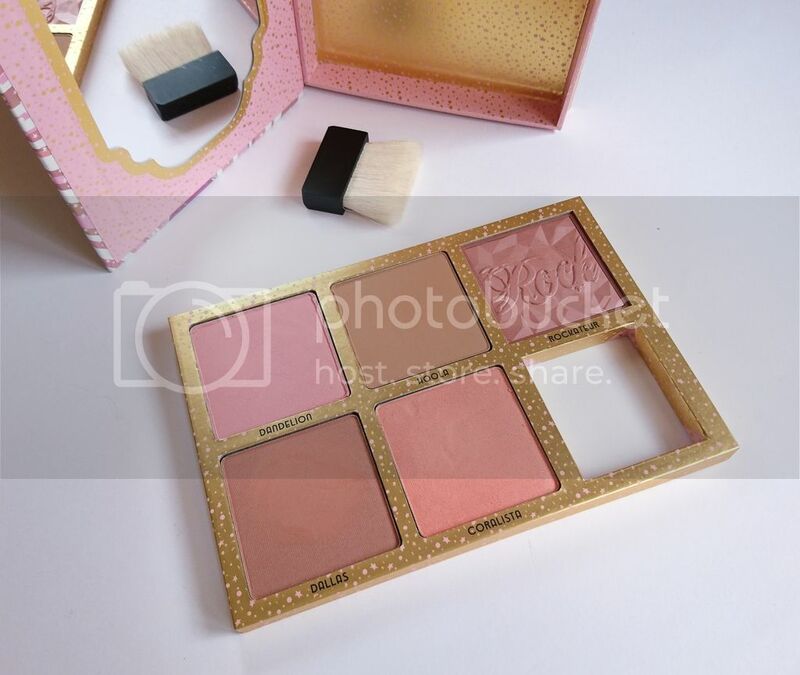 Benefit blushes have a distinct scent, which to me balances between Fanta and soap. I can’t quite put my finger on it, but the scent is really pleasant. 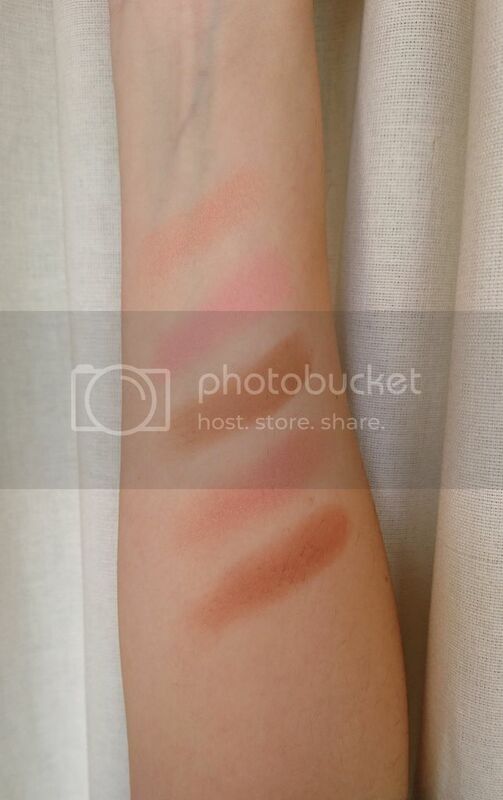 If you are easily irritated by scented makeup products, I would suggest steering clear of these blushes. By far the most surprising fact regarding this kit, is that the (cardboard) insert pops out. 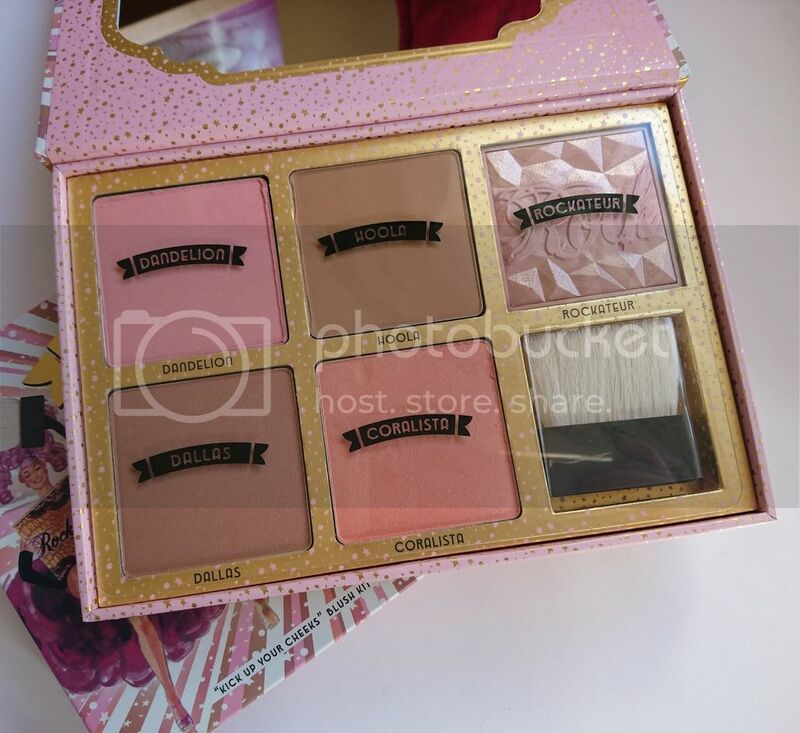 I am not too disappointed because I find the whole package design a bit childish and not attractive at all, so most likely I would be depotting them anyway. But that’s something to beware of when handling, since it’s not that hard to be dropped and have your blushes crumble into a billion really expensive pieces. Cheap, unattractive packaging aside (lol, how sweet of me! ), this kit is actually good value for money. You get 5 full sized Benefit blushes for $58 (59,95€) that you can easily pop into a Z palette and use on a daily basis, fuss-free. As I mentioned in the title, this set is a limited edition item, so if you are interested in it, better search for it fast before it sells out everywhere. Will you run and get it?